First off, a nod to a classic cookbook, and one of my favorites, Joy of Cooking. We had two pork tenderloins to roasted and I needed a simple, classic recipe. Times like those almost always lead me to Joy of Cooking. It’s a fail-safe and fabulous reference for recipes for over 4,500 of the most beloved American dishes (at least, the 2006 edition contains that many. 4,500). Need to make a pan sauce? Joy of Cooking. Need to roast a chicken? Joy of Cooking. Making dumplings? A yellow cake? Green beans almondine? Biscuits? A standing rib roast? Joy of Cooking. It’s been named by the NY Public Library as one of the 150 most influential books of the 20th century (dude…). If you don’t have a copy, or are looking for just one cookbook to guide you through common kitchen adventures, I suggest picking one up. And, you’ll have it forever- these books make great heirlooms. Preheat your oven to 500 degrees. Mix spices and oil together, and rub down tenderloin with the resulting paste. 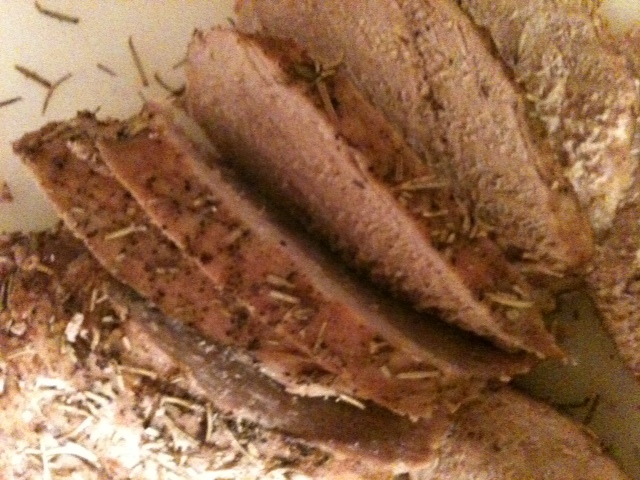 I used rosemary, which gave off a very nice smoky, herbal aroma while roasting. Once oven is hot, put the tenderloin on the rack of a roasting pan and cook at 500 for ten minutes. The rosemary began to smoke a bit here, but I stuck it out and the house didn’t burn down. Turn the oven down to 250 after ten minutes is up. Roast here for 1- 1 1/2 hours, or until a meat thermometer reads pork as 145; don’t be scurred, the USDA recently dropped pork temperature safety guidelines. Great news, as pork is so often over-roasted and dried out. Also great news as I like to dance with danger, haha. When roasting time is up, let the tenderloin rest on a cutting board for 10-15 minutes, loosely tented with foil. Cut on a diagonal in 1/4-1/2 inch slices, and enjoy your beautiful dinner! 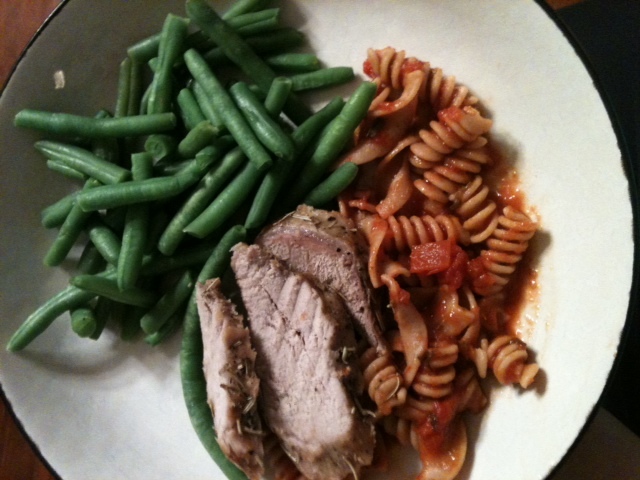 I served ours with green beans and some whole wheat pasta tossed with Barilla garlic & olive oil marinara. Quite simple, quite tasty. This entry was posted in Classics, Dinner, Easy, Fancy, Gluten free and tagged easy pork tenderlon, joy of cooking, pork, pork tenderloin, rosemary pork tenderloi. Bookmark the permalink.